The Hangover Part III star Bradley Cooper will voice the gun-toting Rocket Raccoon in the live-action adaptation of Guardians of the Galaxy. Vin Diesel has confirmed that he will provide the voice and performance capture for the tree-like creature Groot. Cooper and Diesel join Chris Pratt, Zoe Saldana, Dave Bautista, Benicio del Toro, John C. Reilly and Glenn Close in the sci-fi action adventure. Based on the Marvel comic book series, the story centers on Peter Quill (Pratt) a.k.a. Star-Lord, a U.S. pilot who ends up in space in the middle of a universal conflict and goes on the run with futuristic ex-cons: Drax The Destroyer (Bautista) a knife-wielding green warrior, Gamora (Saldana) an alien assassin, Groot (Diesel) a giant fighting tree and Rocket Racoon (Cooper) a genetically engineered gunslinger — who have something everyone wants. 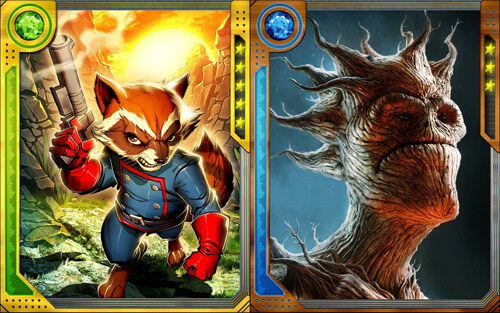 Guardians of the Galaxy will open in 2D and 3D theaters on August 1, 2014.